IBM Connections Files Cloud is a new standalone cloud service that combines the ability to share files with internal and external users with the ability to synchronize users' files across their own devices. Small to medium businesses, line-of-business departments, or corporate IT can sign up easily and start using the service immediately. The familiar browser interface, desktop clients, and mobile applications provide simple ways to get to the most important files and keep them in sync with other users and devices. Each user gets 1TB of space and administrators can always get more as needed. Check out Ovum's report on why IBM Connections file sync and share is a leader in this space. 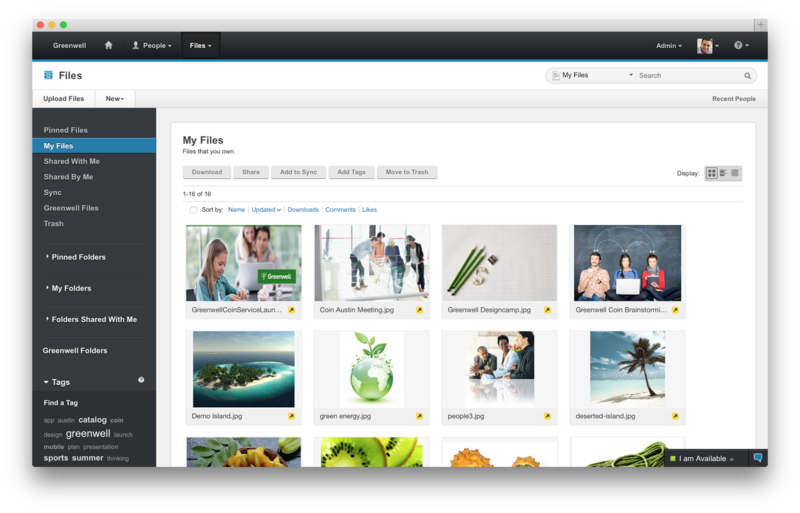 One place for enterprise file storage, sharing, and syncing plus social – find experts, see profiles, post status updates, find content with tags and more. Simple collaboration inside and outside your organization. Easily and instantaneously share files with colleagues, partners, clients and suppliers. Robust access control. You decide who can read and edit files with role level access control. The included Profiles capabilities allow you to find and connect with colleagues via their business card and contact information. More value for your money. You get market leading file sync and sharing capabilities PLUS the benefits of key social collaboration capabilities at a lower price than many other vendors.